There are many options available when you want to start your own venture and shine as an entrepreneur. If you have the skill to interact with people and understand their needs, a career in concierge business may be just the right thing for you. 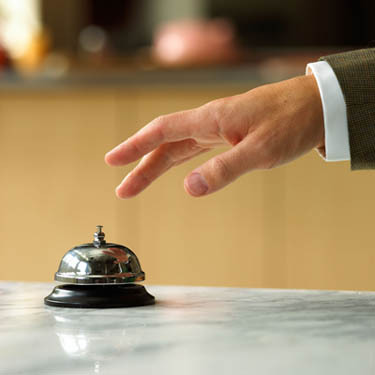 A concierge serves as personal errand provider to guests in hotels, apartments and business setups. Concierges handle customers and cater to their various requests and fulfill diverse needs. When you run a concierge agency, there can be a number of professionals to cater to client needs or you may also run a one man show, if you are adept at multi-tasking. While running a concierge business can prove to be beneficial and profitable, you need to learn the nuances well. Unless you prepare and plan well, chances of success will be remote in fiercely competitive hospitality industry. To operate concierge services personally or run such a business with a group of professionals, you need to meet the legal obligations first. You have to know what sort of license you need to obtain to stat such business. It is also important to know what kind of insurance will be suited for your business. Of course, you will find such resources online easily. This is very important when you start concierge services. As a matter of fact, these services are required in many hotels and business setups. However, you have to find out a region nearby where supply is inadequate compared to demand for concierges. When you state such a venture, operating in a region where competition is stiff is not such a prudent idea. Concierge services are not necessarily restricted to hotels. They are also needed in healthcare facilities, resorts, big families, travel agencies etc. You have to figure out which options suit your penchant and match your skills the most. When you begin concierge business, tasks like managing the resources and setting up infrastructure become necessity. Basically, you have 2 options. You can hire a place or operate out of your home. In both cases, incurring some expenditure and basic infrastructure development is necessary. You may need to tie up with local business to promote your business and reach out to target clients without wasting time. Negotiate with travel agencies, home utility service providers and similar agencies in your region to promote your services. Resorting to pamphlets, leaflets and TV ads are other effective ways to reach out to potential clients quickly. To make your business visible to niche customers, utilize all online methods. You can use email marketing and social media platforms to promote your concierge business fast. Use social media sites like Facebook and LinkedIn to post ads and offers to attract customers. You also need to develop a website to promote the business. Ensure your contact information is made available in all such online platforms and clients can contact you whenever they want. While catering to client needs and understanding of their needs can be learnt while working, you can still opt for grooming courses. Personality development and communication skill sharpening will help you convince new clients and win their trust easily. If you develop new skills like learning a new language, that will work in your favor for sure. This is a golden rule for success in concierge business. Client demands may seem erratic and border on weirdness at times, but you should not lose your cool. No cent wants to interact with a cold or indifferent concierge. Evans is a blogger and he is currently associated with Symbolic Concierge.